It’s February. Love is in the air. And if you’re single, don’t close out of this blog just yet. Love doesn’t have to involve a person… even on Valentine’s Day. So don’t clip Cupid’s wings or give him an arrow enema just yet. I love dessert. I love chocolate. I love ice cream. And more recently, I’ve started to love coffee. So for this Valentine’s Day, I’ve cooked up a little three-way love. Whether you’re celebrating with the one you love or you’re loving yourself, this is the perfect way to end a romantic meal. First of all, cook dinner. Restaurants will be packed and expensive. Heating up the kitchen is the best way to express how you feel. I mean, if you hate someone you can poison them (just kidding… kind of) and if you adore someone you’ll prove to them that they’re worth your time, creativity, and hard work. To show just how sweet you are you’ll want to end the menu with some sugar. If the night goes well, and you know it will, you’ll want to keep it going. Wink, wink. Nudge, nudge. 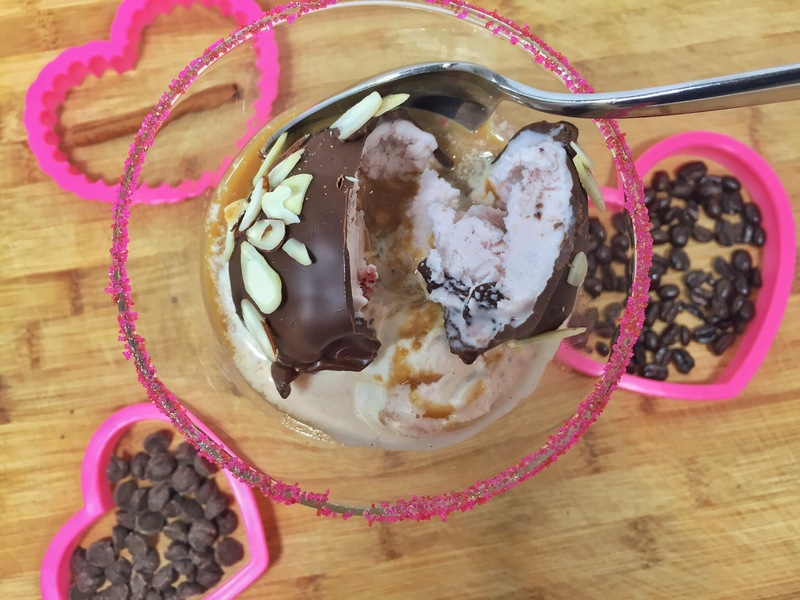 The treat I’ve created combines chocolate (duh, it’s Valentine’s Day), ice cream (to cool you down), a little spice (to spice things up), and coffee (to keep you awake for whatever’s next… wink, wink). It’s based on the Italian treat affogato, which means drowned. Traditionally, it’s vanilla gelato topped with freshly-brewed espresso. The hot coffee starts to melt the ice cream. It’s just creamy, icy-hot goodness. First, line a small cookie sheet with parchment paper or wax paper. 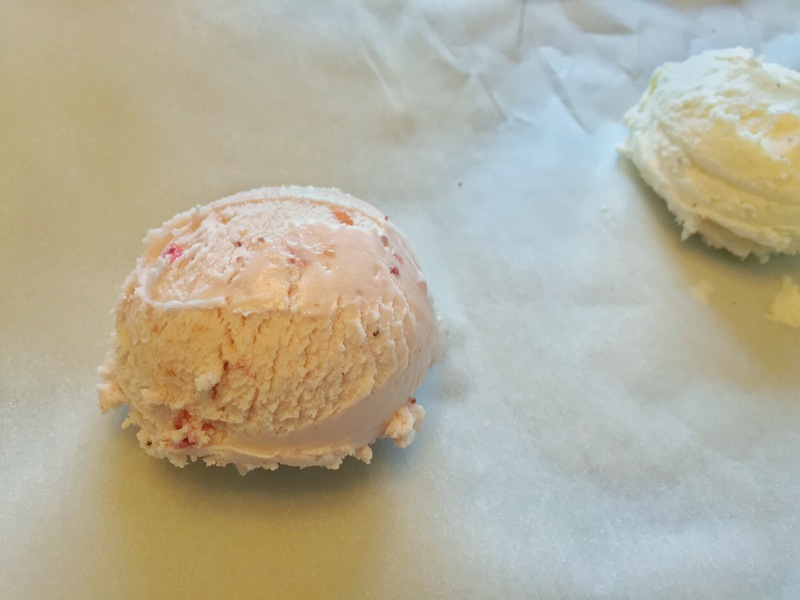 Portion out 2 scoops of strawberry ice cream and 2 scoops of vanilla, and set them on the lined cookie sheet. Put the scoops in the freezer and let them harden for at least 30 minutes. The honey and sugar are for decorations. 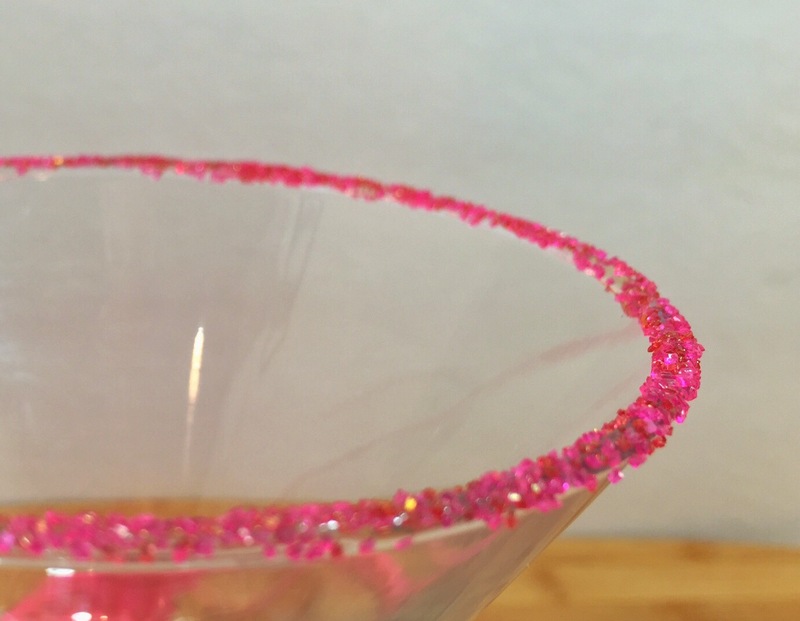 If using, dip a clean finger in the honey and coat the rims of 2 martini glasses. You can use wine glasses or even mugs. 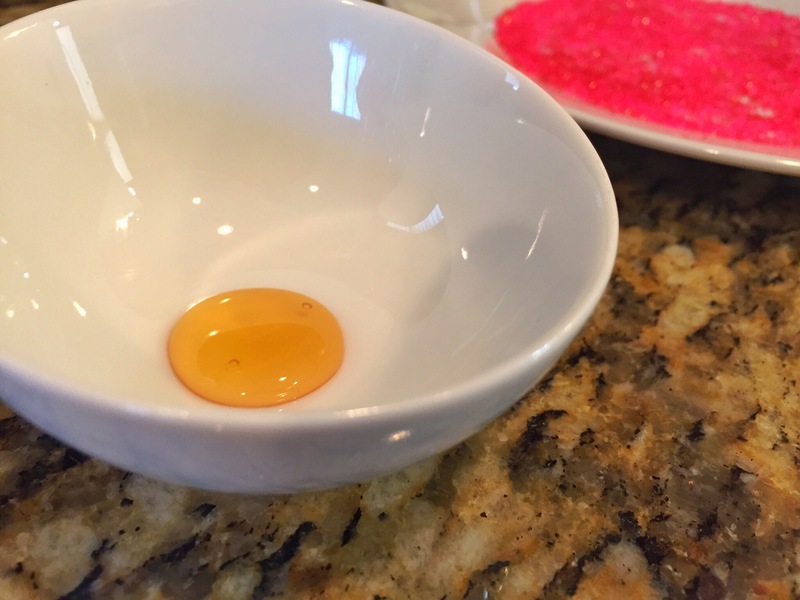 Pour the sugar onto a small dish and dip the honey-coated rims into the sugar to cover them in sparkles. 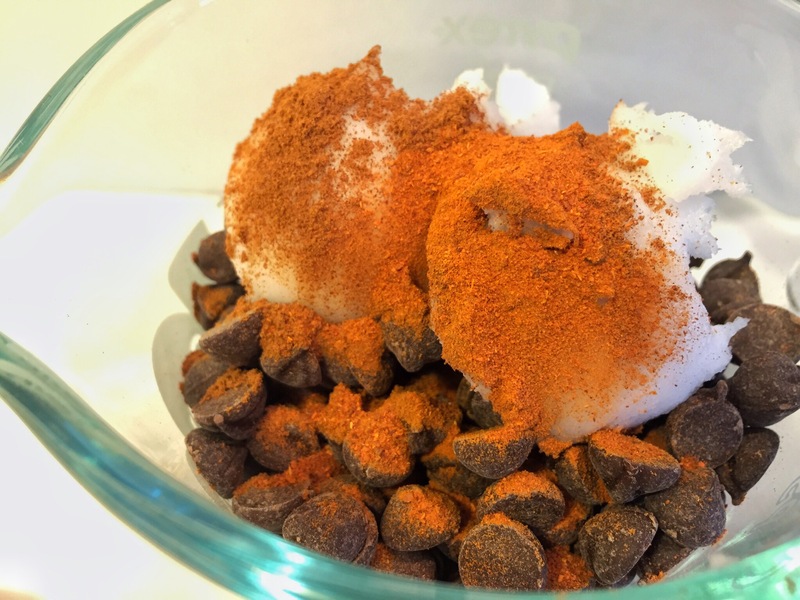 In a microwave-safe measuring cup or bowl, combine the chocolate chips, coconut oil, cinnamon, and cayenne. 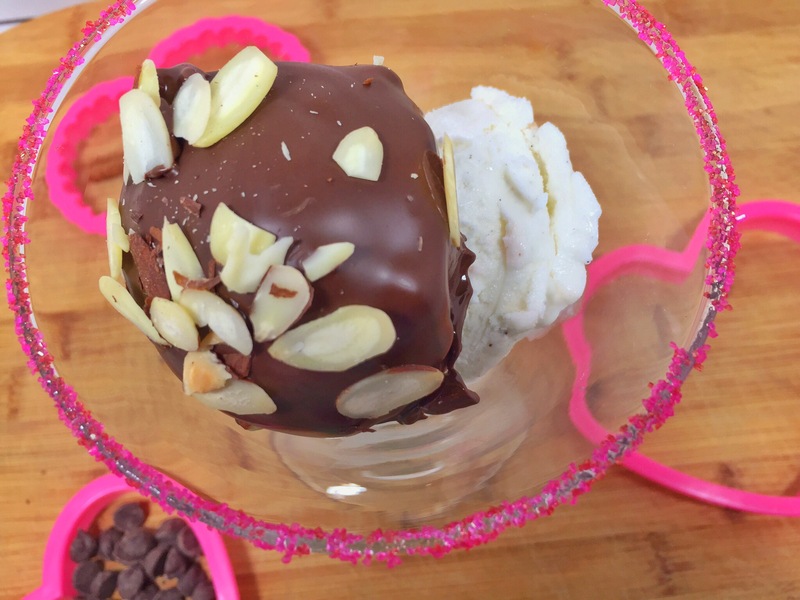 You’re making a dark chocolate shell for the ice cream! Using the defrost setting on your microwave, melt the chocolate, coconut oil, and spices. Do this in short increments, stirring each time. The defrost setting will keep the chocolate from scorching. 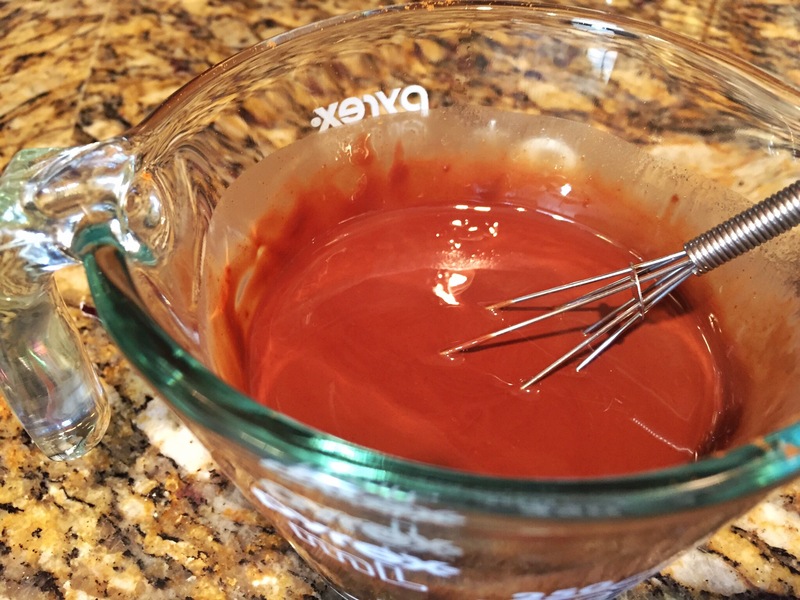 Whisk all the ingredients together until they’re combined and smooth. Brew your coffee. I used a single-serve machine, but you could make the coffee however you’d normally do it. You only need a few ounces. You could even save some of your morning coffee and heat it up. While the coffee brews, dip the strawberry scoops into the magic shell one at a time. Work quickly if you don’t have a way to keep the coffee hot. I stabbed each scoop with a skewer, dipped it into the shell mixture and set them on the cookie sheet. As soon as you remove the skewer, sprinkle on some sliced almonds. They will cover up the hole left by the skewer. The shell will harden quickly. Now set one scoop of vanilla into each rimmed glass. Top with the the magic shell-coated strawberry ice cream. 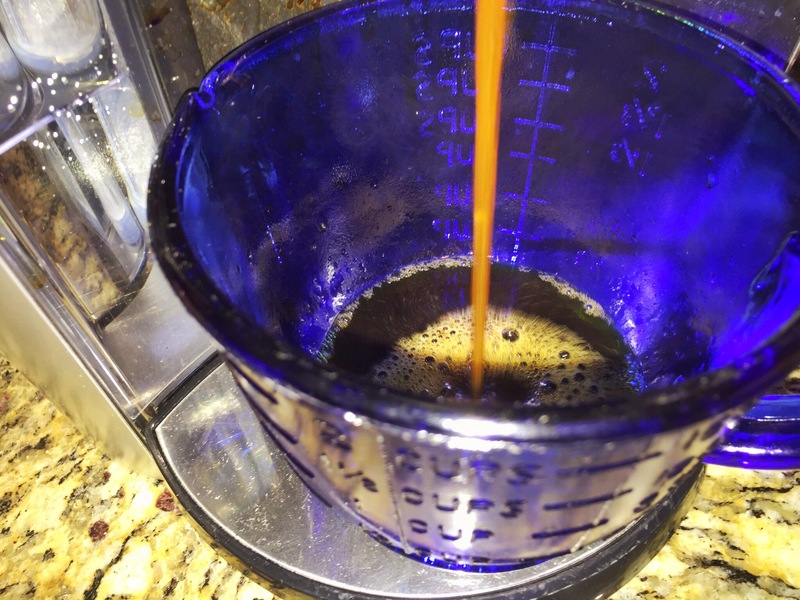 Now pour on the coffee, letting it run down the side of the glass. You want to add enough coffee to just cover almost all of the vanilla. Serve immediately! 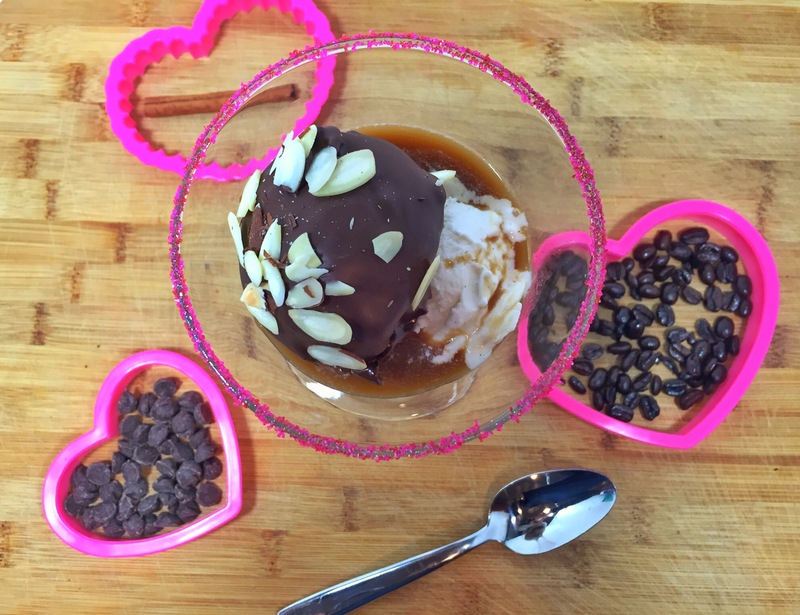 The vanilla ice cream will melt and act as creamer to mellow the intensity of the coffee. 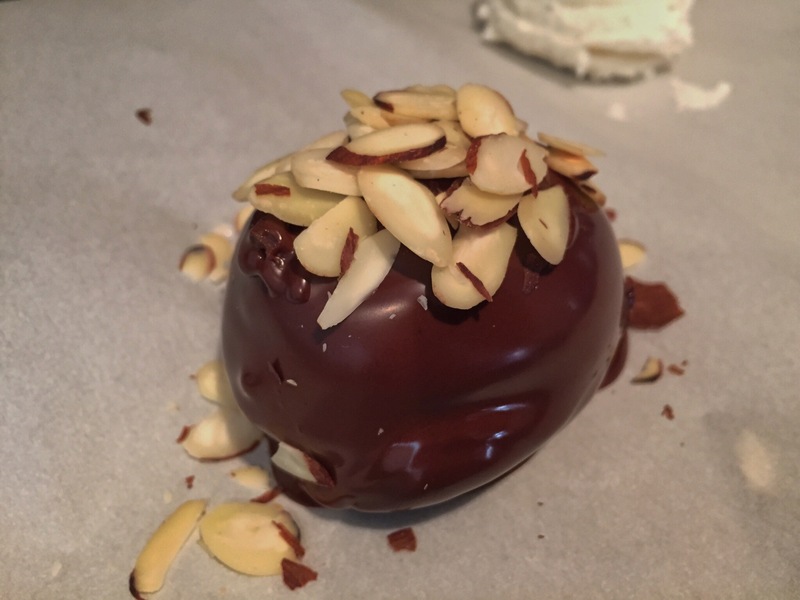 The chocolate shell is decadent. The cayenne creates a light burn in the back of your throat. The cinnamon is warm, but spicy. The strawberry offers bright sweetness, and the almonds are crunchy for a bit of texture. I won’t think badly of you if you serve this for breakfast. I mean, there’s coffee in it, right? Don’t be afraid to make this your own. Leave out the cayenne if a little heat scares you. You could use flavored coffee if you like… Amaretto, vanilla, and caramel would be great. 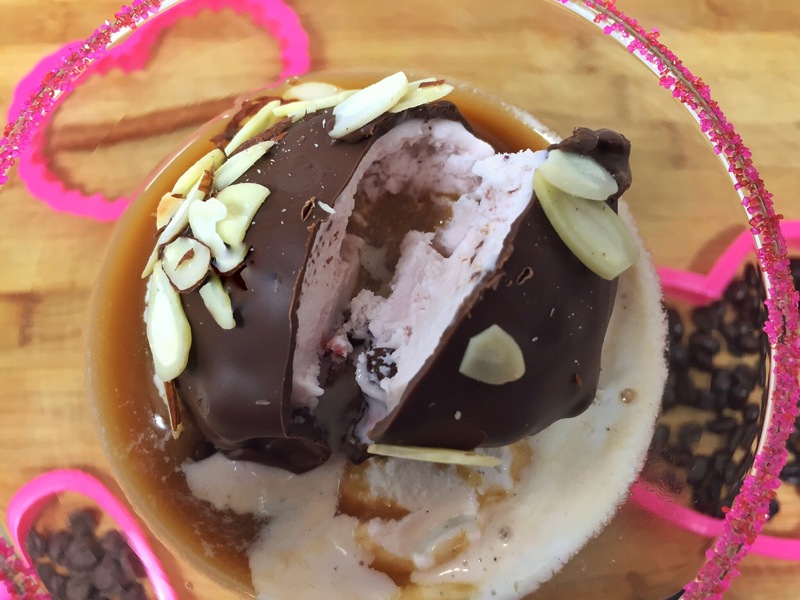 Try different flavors of ice cream… Black cherry, pistachio, or butter pecan would be great. If you’re celebrating with someone, drown them in love with this drowned coffee. If you’re celebrating alone, don’t drown yourself. Take it out on the ice cream, OK? 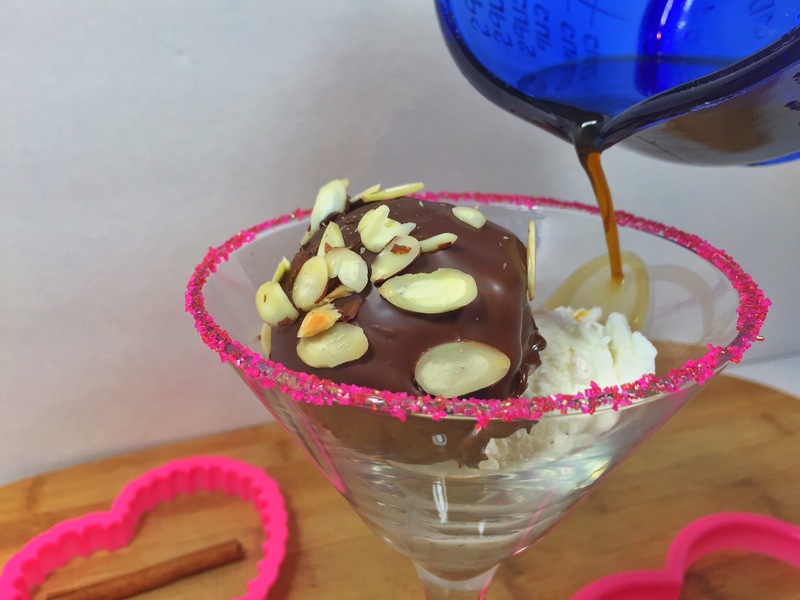 Tip: To get extra naughty, add a tablespoon of amaretto liqueur, Kahlua, or dark rum to the coffee before you pour it onto the ice cream.